We have a main playing room which can hold up to 16 tables. The dedicated wooden chess tables have inlaid boards, but in recent years the contrast between the inlays has become dull and now many players prefer to use separate boards on top of white tablecloths. Score sheets are provided for all match play. There is a full selection of modern clocks - both digital and analog, and also some older clocks which we ask players to use for 5 minute chess. We have a lending Library which contains a broad selection of titles - generally of a type which will have permanent value such as game collections, biographies, middlegame and endgame instruction, and opening principles. We tend to avoid the latest fashionable opening books as these tend to have a limited lifespan. 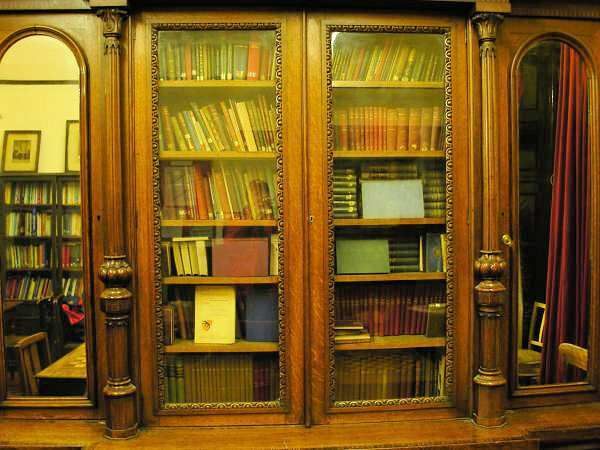 We also have an extensive historic library which members can consult on the premises by arrangement, as well as a number of collections of books and scorebooks such as the Aitken Collection which belonged to Dr James Macrae Aitken (1908-1983), who was Scottish champion 10 times between the years of 1935 and 1965, and played for the club before he moved to England where he worked as a codebreaker at Bletchly Park. There is a small analysis room where players can analyse their completed games without disturbing other matches. A notice board provides information on all club activities while another smaller one displays entry forms for congresses in Scotland. The trophy cabinet contains a number of fascinating historic artefacts and will be of interest to many players.